Canine Socialization Period (21 - 49 Days): Interacting with his mother and littermates, the pup learns various canine behaviors. He is now aware of the differences between canine and human societies. BEEN IN 7 different locations: Front Yard Back Yard Basement Kitchen Car Garage Laundry Room Bathroom Crate Kennel Etc. BEEN EXPOSED to 7 challenges: Climbed a box Climbed off a box Go thru a tunnel Climbed up steps Climbed down steps Climbed over obstacles Played hide & seek Go in & out doorway with a step Etc. EATEN FROM 7 different containers: Metal Plastic Cardboard Paper China Pie Plate Frying pan Etc. EATEN IN 7 different locations: Crate Yard Kitchen Basement Laundry room Bathroom X-pen Etc. 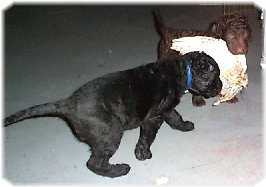 Human Socialization Period (7 to 12 Weeks): The pup has the brain wave of and adult dog. The best time for going to a new home. He now has the ability to learn respect, simple behavioral responses: sit, stay, come. Housebreaking begins. He now learns by association. 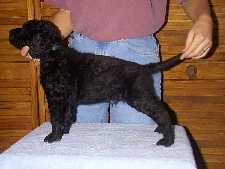 The permanent man/dog bonding begins, and he is able to accept gentle discipline and establish confidence. Well, we are at the first day of week 7. This is a week when a lot happens in a puppy's brain. The pups have started developing unique personalities, and this will continue even more this week. The pups play harder and more often. They compete for the best toys and the best spots to sleep. Pack order is developing. 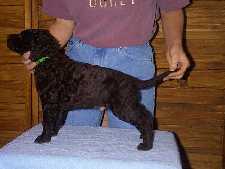 Some of the pups that I would not think of as dominant are trying to move up the pecking order. At the end of this week we will do puppy evaluations. I'll tell you more about this as we get closer. Yellow collar black girl tends to try to take on the larger boys. She has latched onto Green collar boys ear several times! I notice she likes to do a sneak attack... while he is occupied with a toy or sibling. Red collar liver girl tends to only pick on her own size. She and pink girl hang out together a lot. If the gang is particularly rambunctious, they will go in the swing and watch. They both aren't opposed to biting someone's tail as they run by! Yellow collar liver girl is more interested in any person in the room than with her siblings. The two liver boys have not jostled for dominance at all. Both of the black boys are about even, but don't seem to pick on each other. The pups still nurse on Gabby occasionally. They have very sharp teeth! She only lets them while she is finishing off the puppy mush. She will jump on top of the overturned vari kennel to get just out of reach, but still be with them. The pups have some meals with watered down kibble, some with the puppy mush, and also are given dry food to play in... I mean eat! I wormed the pups again today. The biggest ones weigh over 10 lbs now. This is just one type of temperament test. We observe the puppies very closely until 7 weeks of age and usually we have formed our own opinion about their temperaments. We use the Puppy Aptitude Test (P.A.T. ), developed by Jack and Wendy Volhard, to confirm our observations. The test is supposed to be done at 49 days of age. 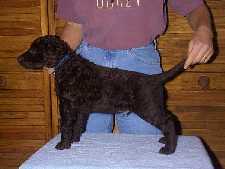 The test is performed in a situation which is new to the puppy and must be carried out by a person who is a complete stranger to the puppies. 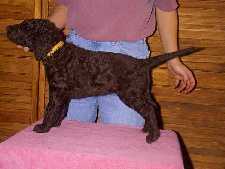 Another terrific temperament test is the PAWS Working Dog Evaluation. PAWS stands for Possessiveness, Attention, Willingness, and Strength and is an excellent test for evaluating the drives of older puppies. Here are all of the pups at age six weeks and two days. (Day 44) Today we took a trip into town. (approximately 30 minutes each way) where we took our first set of stacked puppy pictures. The pups not being photographed spent time in an X-pen in an unfamiliar building. The whole outing took about 3 1/2 hrs. Considering standing for pictures in a stacked position is not anything the pups are used to, and is not fun, I think they did very well. To make it easier to tell who is whom, I kept the collars on, and stood the boys on a blue towel, the girls on a pink one. Click on any pups picture to see a larger image. Only one pup made a mess on the trip into town. No one made a mess on the way back. Everyone was quiet and sleepy on the trip home! (not so on the trip there!) This is good practice for the pups first trip to his or her new home. Tonight I took a vari kennel half, and put about 3 inches of warm water in the bottom of it. Threw in some toys, and let the pups explore. Some just lapped at the water, some went in after a toy. It is not deep, so the pups can easily walk, splash or dig at it. 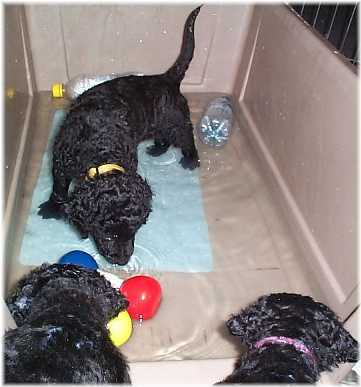 Some pups will submerge their muzzles up to the eyes and blow bubbles, or slap the water with their paws. Some will do this in the water dish too! When the weather turns warm and you introduce your pup to water, don't force the issue. Never throw your pup into the water, or push him out of a boat. This is not the way to get him to love the water! One of the most effective methods of introducing a puppy to water is to bring along an older, water-loving dog as a demonstration tool. (as long as you supervise and make sure the older dog does not play rough) Puppies will generally follow the leads of their elders, and will be reassured to see that the strange, wet stuff doesn't seem to hurt their friends. But in the absence of an older dog you will do the trick. Wade out into the water yourself. Chances are your pup will want to follow you. Use a favorite toy and throw it parallel to the shore once he is in the water up to his belly. Don't throw the object out into deep water the first time. Let him get used to the feel of the water. 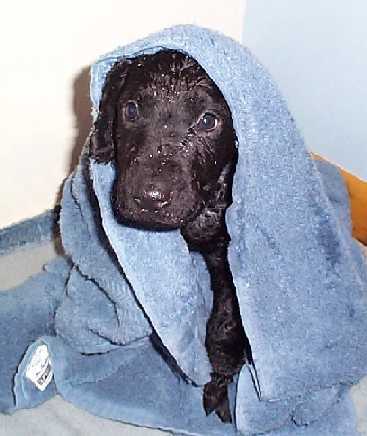 The most important thing to avoid, is to allow your puppy to have a “bad experience” when introduced to water. Make sure the water is warm enough the first time. (water temperature over 50 degrees) You may want to get a child's wading pool and throw some floatable toys in it for the pup. Place a non slip tub mat in the bottom if it is real slick. Don't take the pup in the first time to a body of water with steep drop offs or water that has lots of "scary" objects. 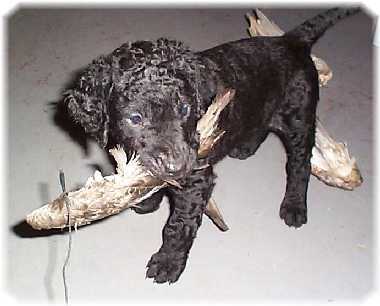 Remember your pup may be going through a fear stage, and submerged logs or stumps may give throw him off. Happy Thanksgiving! The dogs all get a special treat today. The larger dogs got some organ meat, turkey necks and backs with their meals. The pups got to experience some leg bones and larger wing bones. Their sharp little teeth aren't strong enough to chew through those bones yet, but they had fun gnawing on the cartilage and any remaining meat clinging to the bones. They also got a little bit of ground turkey in the normal food they eat. You should not overdo it on the holidays. Some holiday food can do much more harm than good, and is not worth the brief pleasure it gives your pet. The cooked turkey bones can lodge in the animals' throats or puncture the esophagus, stomach and intestines. The string from the turkey or roaster bag is also a potential hazard. While a little bit of meat -- beef or poultry -- won't hurt and would be appreciated, treating your dog to a turkey dinner with all the trimmings can make them very sick. Rich, fatty foods, like gravy or grease, can cause problems ranging from stomach upsets to pancreatitis, which is an inflammation of the pancreas resulting in pain, vomiting, and dehydration. Pets with this serious condition often require hospitalization for treatment. No one is saying your pet shouldn't enjoy a special holiday meal, too, but limiting the kind and amount of special food will ensure that it is a treat -- not a trouble. The pups got very competitive over the bones. Some readily shared with siblings, others tried to hide in a corner of the shark cage and keep the treat all to themselves. Anticipate guest arrivals and con fine your dog to prevent escape out the open door, running away or in front of a car. Reduce stress by maintaining your dog's regular feeding and exercise routine and setting aside a quiet room where it can escape from holiday parties. Too much excitement may cause stomach upset or trigger a preexisting illness. Place mystery packages out of reach. Dogs often chew apart packages containing food that could make them sick. "Food is the No. I holiday hazard for dogs," said Amy Marder, VMD, vice president of companion animal services for the American Society for the Prevention of Cruelty to Animals. Tell guests to avoid giving treats from , the dinner table. Poultry skin. Fat rich gravies and buttery sauces can cause severe vomiting, bloody diarrhea and even life-threatening inflammation of the pancreas. An ounce of 20 to 40 proof alcoholic beverage can put a small do in a coma. STOW chocolate candy, baking chips and especially baker's chocolate out of reach. "Chocolate is the most common toxicity we treat during holidays," Dr. Proulx said. Eating even small amounts causes"vomiting and diarrhea. Large amounts can cause abnormal heart rhythms and nervous system malfunction, even death. Secure garbage in bins with dog-proof lids or behind locked doors. Dogs may chew up holiday throwaways such as meat scraps, bones, paper, foil or plastic flavored with food, -and even gift wrapping and ribbon, which can absorb food flavors. Ingesting these items can result in vomiting, diarrhea or intestinal perforation or obstruction. Read labels on products such as tree water preservatives and artificial snow, and buy only those labeled nontoxic. Put away toys after children open them. Small plastic and rubber balls are common causes of choking and intestinal blockage in dogs. Ingested plastic or cloth toys must often be removed surgically. Consider a smaller living or cut tree that can be positioned on a tabletop, making it harder for your dog to reach decorations or knock over the tree. Secure larger trees to a wall to prevent tipping, and use a screen around the base to block access to electrical cords and gifts. Fasten all decorations securely and arrange breakable ornaments toward the top of the tree. 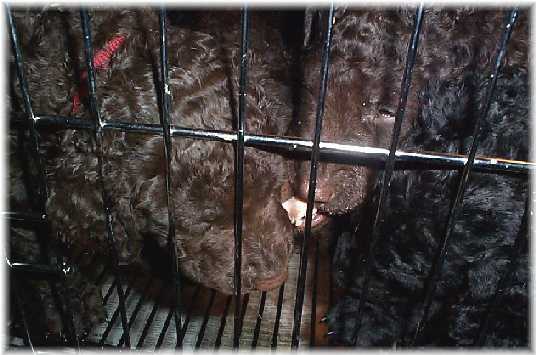 Dogs may chew them and suffer cuts in the mouth. Tinsel and angel hair can cause digestive tract obstructions. "Bubbling" lights filled with methlene chloride, can be mildly toxic. Return paper, ribbons and yarn to their storage places after gift wrapping. Bored, anxious or merely curious dogs may choke on them. Place holiday plants out of reach. Poinsettia can cause mild symptoms of drooling, oral pain or vomiting. Mistletoe can cause vomiting, diarrhea, labored breathing, shock and even death from cardiovascular collapse. Vacuum often. Eating the needles of both real and artificial trees can cause intestinal blockage. Display candles on high shelves, and use fireplace screens to avoid singed whiskers and painful burns. Tuck cords out of reach. 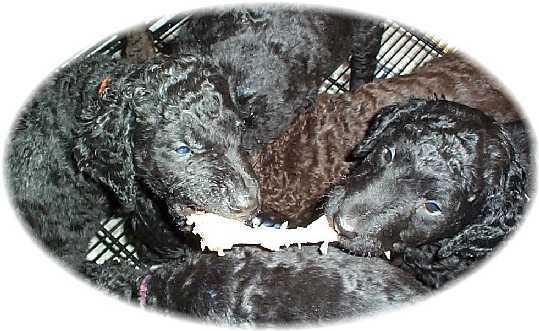 Bored dogs and teething pups often get electrocuted when they chew on them. The puppies got first set of shots today. I give my own shots. (Did I mention I used to be a Vet Tech, and am now an RN?) I don’t recommend giving your own shots unless you know what you are doing, know what the signs and symptoms of a vaccine reaction are, and know what proper storage and handling the vaccines need. I do not vaccinate at home to save money. I do it to limit the exposure of the pups that may not have adequate immunity. My Vet knows I do my own vaccinations. I do them during regular office hours in case a pup has a vaccine reaction. The pups hardly notice that they are getting the shots. Only one whimpered at all. Some tried to scratch at the site a few minutes later, then soon forgot all about it. I picked each pup up, cleansed the back of the neck with alcohol, pulled up the loose skin in the shape of a tent, and injected into the area under that loose skin. Every pup will go home with a shot record with the date, type of vaccines, manufacturers name, lot number and expiration date. 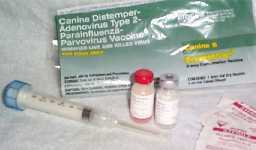 A lot has been said recently about vaccinations and immune systems in dogs. Every vet will have a different protocol of vaccinations that he or she thinks your new pup needs. Every area of the country is different. If you're going to kennel your dog, you should ask your vet about kennel cough or bordetella vaccine. Ask your vet if Lyme's disease is an issue where you live. If your pet spends a lot of time in grassy or wooded areas where deer or field mice hang out, you will want to vaccinate for Lyme's disease. Leptospirosis is another vaccine that should only be considered if the disease is common in your area, and it likes to spread via contact with stagnant water such as ponds or puddles as it is eliminated in the urine of infected wildlife. Many vaccinations come in a combo shot- you may hear them called Canine 7, Canine 5, etc. These vaccines often are administered together in a "cocktail." Some of these vaccines contain leptospirosis, coronavirus, adenovirus cough, distemper, hepatitis, parainfluenza and parvovirus. I don’t like to overvaccinate. I used to give two sets of shots before the pups left, I have since cut that down to one series, and let your vet pick up from there. I give a vaccination without Lepto or corona. Why do we repeat vaccinations? The pup get passive immunity from mom when nursing. They pick up her antibodies through the milk. This immunity will actually interfere with the pup's ability to make its own immunity from the vaccine challenge. 9 weeks of age: Give second combination vaccine. 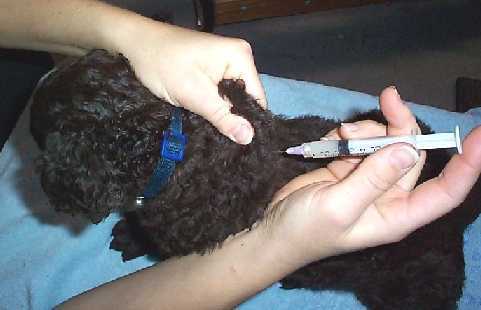 12 weeks of age: Give the third combination injection and possibly a LYME Vaccine inoculation. Generally a LYME vaccine is then repeated two weeks later, then once a year. 16 weeks of age: Give the last combination vaccine. Another nice day the pups spent outside. Later, I stacked them all on the grooming table to get them used to it, then clipped nails. That's 160 toenails to clip! If dewclaws were left on, that would have been another 20 nails. 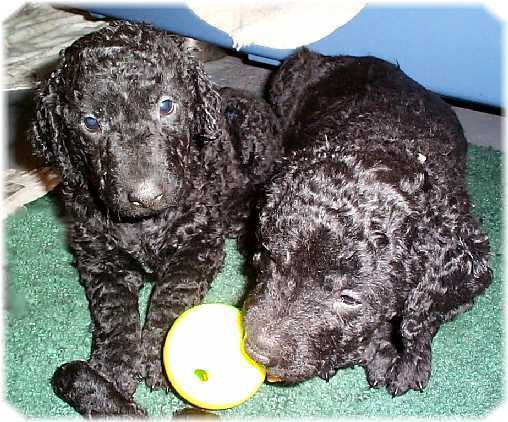 When the pups were younger, the nails were soft and easy to nip off. Now they are more like dog toenails. Tougher, darker. Harder to see the quick or vein in the center of the nail. With 160 nails to clip, I only nicked one quick. I use Kwik-Stop coagulant powder to stop the bleeding. The pup didn't seem to mind. (Yellow girl) She was more interested in the attention, getting petted, and the treats. I like to get a young pup used to having his feet handled often. Don't just grab your dog and go to town clipping his nails! Get him used to you touching his feet, touching his nails, spreading the webbing in the feet. Leave the clippers out where he can sniff at them, check them out. You may even pretend to do your own nails with the clippers to get the dog interested in them. Get your dog so you can just touch the clippers to each of his paws. Reward the pup when he lets you. Get the pup used to you touching each toe with the clippers. Reward and praise. Make this a pleasant, positive time. 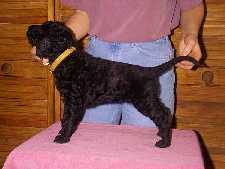 Its easier to take the time and condition your dog to having his nails trimmed than to fight your dog each time. Do not use scissors or human nail clippers on your dog. They are not designed for the task and can crush the nail causing your dog some pain. 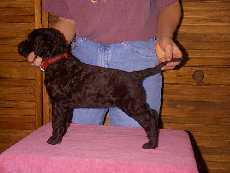 Your vet or local pet store carries several types of clippers designed for the dog nail. Make sure you have the right size for your size dog and keep the blade sharp. The guillotine type has a replaceable blade that can be discarded when it is no longer up to snuff and are the easiest to use for most dog owners. It's a good idea to let the dog get used to seeing the nail clippers. Bring out the clippers and lay them down. Do nothing with them, just let them lie there. Have them in a spot where the dog can't help but notice. Leave them out for a few days so the mere sight of them is no longer so upsetting. Some owners like to use a small grinding-tool to keep the nails short. These work well, but the dog must be used to them as the sound of the motor can be frightening. In case of bleeding, have on hand a styptic pencil or Kwik-Stop powder. These will immediately stop the bleeding when applied to the nail. A nail file designed for dog nails will put on the finishing touch. Before you call the dog over, ensure you have your clippers, file and styptic powder ready. 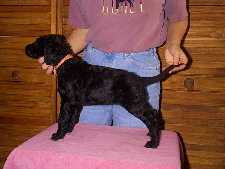 If your dog is unruly for the clipping, ask someone to hold him for you. If you have a small dog, use a table or counter with surface that will not allow the dog to slide. If you have a large dog, you may choose to clip on the floor. It may be easier to work on some less than cooperative canines by having them roll over on their backs for you. Holding the clippers in your right hand (or left if you are left-handed), firmly grasp one foot and place the clippers over the nail. Make your cut at a 90-degree angle, about 2 millimeters from the end of the quick. If you cannot see the quick, try to gauge how far it will go down the nail and cut there. Usually, the quick will extend about ¾’s of the way down the nail, so you can safely cut about ¼, or up to where the nail starts curving. It may be easier to make two cuts if you are not sure how far up to go. If the dog’s nails are very long, do not be tempted to cut back too far. Cut just the end off and then cut them about every 7-10 days until they are back to where they should be. This will give the quick time to recede so that you are not cutting into it. If you do cut too far and the nail bleeds, don’t panic. It may be uncomfortable for the dog, but it is not life-threatening. 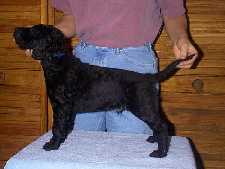 Apply the styptic pencil or powder to the nail and wait a moment until the bleeding stops before letting the dog walk. Remember to clip the dew claws back as well and file each nail gently when you are done to smooth the rough edges. Reassure your dog as you progress. Use a calm voice and let him know that you are proud of him. When you have finished, give him a treat. Bath Time! Why is it that from the instant the first drops of water spill out of the tap, from the second you reach for the bottle of shampoo, your dog starts making his way to the darkest, quietest and most hidden corner of the house? The dog who doesn't hear you when you scream, "Get off the couch!" is able to pick out the magic word when you whisper, "I think the dog needs a bath." Your dog disagrees that he needs a bath! Like most dogs, he's content to live his life in dog-smell heaven, a place where water is for drinking or swimming in and never has soap added. Too bad. We make the rules, and dog-smell heaven is no paradise for us. A good attitude can go a long way, but a bad one can go even further. If your dog knows how much you hate bath time, how can he get a positive, or at least tolerable, opinion of the process? Keep your attitude high and don't let up on the praise. It’s great if you have someone to help you the first few times. Many a dog has jumped out of the tub while the owner was pouring the shampoo.... This can lead to a wet dog chase through the house! A dog should be groomed before you bath it. Curlies don't need a lot of grooming, but if your curly is shedding, you may want to use the undercoat rake on him before you start the bath. Check under ears, neck, tail for small mats. Mats stop the shampoo from getting through the coat. Also if you wet hair with knots it only gets worse and can be quite sore for the dog. Knotted hair twists and becomes more knotted, pinching the skin as it does so. Bathing should not be done too often as this removes the natural oils from the skin. If you use shampoos not suitable for dogs then you may damage the coat and skin. The oils that are in the coat are there for a reason, to help in waterproofing and insulation. Use a mild shampoo made for dogs. I like a hypoallergenic shampoo, or an oatmeal based shampoo. Don't use people shampoo, the PH is different. These dog shampoos also lather less and make it easier to rinse from the coat. This is a godsend if your dog doesn't like standing in the bath for too long. If you are bathing your dog in your own bath make sure you put a non-slip mat on the bottom. Not only does this stop your dog from slipping and sliding, it also protects your bath from being scratched. If your dog is wearing a leather collar remove it before bathing, replace it with a nylon type one. You have to make the first baths positive, and a dog that slips in the tub, falls, makes you grab at it.... not a positive experience. The water for bathing your dog in should be lukewarm. Make sure you wet the coat thoroughly before adding the shampoo. 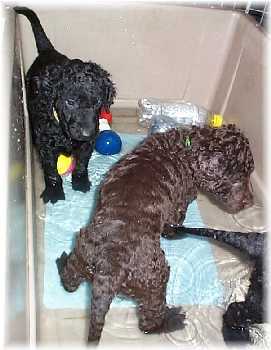 When your curly has his adult coat, you will find it may take some time to soak the coat through. A lot of the water will run right off! 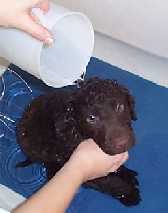 A spray nozzle attachment is the easiest way to wet the dog, and rinse after. When wetting the coat you can help to steady the dog by gently putting your hand under the chin. Talk to the dog to reassure it, it helps to keep everyone calm. Start shampooing at the top and work down. Firstly along the back and neck area then the tail and bottom next the legs and feet. Lastly wash the head area. Most dog shampoos don't cause much irritation if they get into the eyes, but do try to avoid doing this if possible. The dog may want to shake itself while it is being bathed, if you notice that this is about to happen then place your hand on the back of its neck, the scruff, if necessary gently lift the scruff. This action should be enough to stop the shake from occurring. Once you are sure that you have washed the dog all over then it is time to rinse. Again top to bottom. Start with the head, tilt it up slightly, and work backwards. 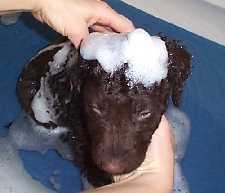 Repeat the rinsing process until you are sure that all the shampoo has been washed from the coat. Once you think you have rinsed enough, rinse again! Nothing is more irritating to the skin than dried shampoo left in! Use your hands to gently squeeze the coat to get rid of the excess water. If you do not do this, the dog will come out of the bath and shake, soaking everything in its path. Pat the dog with a towel. If it's warm enough, I let the dog run around outside to dry. If not, I put them in a crate until they are just about dry. A word of caution -- they love to roll once they have a bath! We took stacked photos again today. Another long car ride into town. The pups settled down much quicker this time. No accidents in the crates. I wouldn't say they behaved better with the stacking though! We caught them at a squirmy stage. Blue boy was racking back, Red girl didn't want her face touched.... generally naughty puppies! I changed around the tentative schedule a bit. Instead of the Vets today, we did the ride and pictures. We are scheduled to do health checks Wednesday morning. Tomorrow is the litter evaluation. It will be done by a neutral person the pups have not met. I can't be in the room, but will try to sneak some pictures through a window! 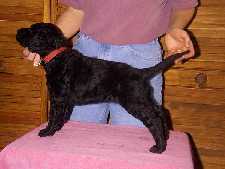 Mary Fowler of GraceFarm Kennels will be doing the evaluation. 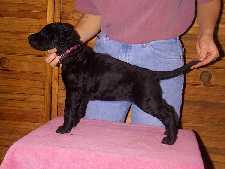 Mary has been breeding Labrador Retrievers at Grace Farms since 1979. She trains retrievers for hunt tests, and teaches all breed obedience and agility classes.